What an amazing week we have had! It’s been very emotional, totally exhausting but I am proud of all the horses!! A massive thank you to my fantastic team who have helped us through a really traumatic time , my lovely owners and sponsors and not forgetting my awesome daughter Holly. 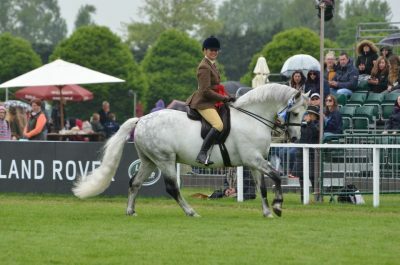 Second day at Windsor was Grandeur (owned by Yvonne Jacques) in the ROR flat class. I had already taken him on the lorry the day before to ride round and acclimatise him to the showground. He was bright on the go round but kept it together to be pulled in top but then with the loudspeakers unfortunately just got more unsettled and struggled to stand still consistently and was quite rightly dropped to second ( I thought that was generous) – in the championship with less horses in the ring he was able to settle more and was awarded reserve champion. He is the most beautiful horse and when settled is a stunning ride and I am hoping in time he will accept the noise of the loudspeakers. I am still proud of how far he has come in this relatively short time from his career as a racehorse and I know he is a true superstar. 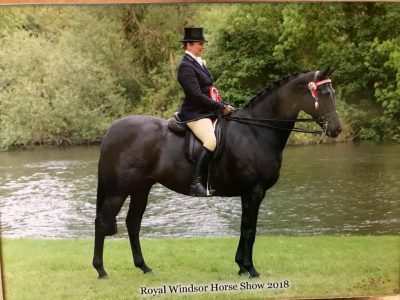 Wards Place Picture Perfect (owned by Janet Hindley ) was next up in the afternoon and he went amazingly to win the non native coloured horse class. He really enjoyed himself in the Queens garden and I am thrilled with the way he has progressed. A first and second in two days was a great result!! 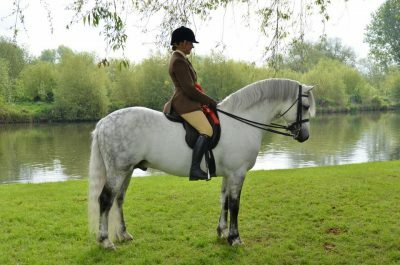 Yesterday (Friday) was the turn of Quinton’s Ernest (owned by Andrew johnson and Marian Burton) in the lightweight cob class. He absolutely loved showing off and was pulled in 2nd in a very strong class. Unfortunately due to a slight communication error he bobbed into canter three times when asked to trot off but then quickly settled to give the judge a lovely ride but this was enough to be dropped to third. 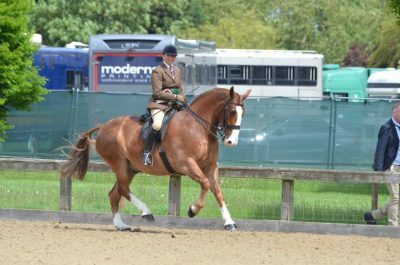 I think the world of this cob and he is really improving with each outing as I am getting to know how he ticks at shows. I think he is a true star!! Elusive (owned by Suzanna Welby) was next on in the afternoon and he was a star and won the large hack class and then went on to give me the ride of my life in the main arena to take the hack championship for the second year running! 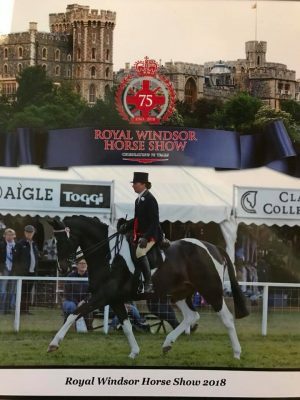 He is the complete showman and I am incredibly privileged to be able to ride this stunning horse and I think he is a horse of a lifetime for me – I am so lucky that Suzanna has entrusted his care to me and Hols. 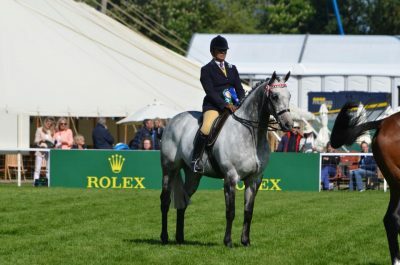 Finally today we took Cashelbay Rocket (owned by Robbie and Barbara Fallon of the Cashelbay Connemara Stud) for the Connemara/new forest Olympia class. He has only been back with me for just over two weeks (Michael Harty has done a great job of keeping him going since Christmas over in Ireland). He went with a big smile on his face and won his class for the second year running and then went overall reserve champion.Love him!! As well as official photographs I was lucky that Holly had her camera to hand and I think you will agree she is one talented girl!